Hey Recipe Critic Readers!! It’s Jenn, from Eat Cake For Dinner, how is everyone? It’s September, yay!!! I love this time of the year. I can’t wait to start making pumpkin recipes, soups and lots of comfort food. For now, I have a really easy and super tasty breakfast recipe. This was a clean out the fridge breakfast that turned out to be AMAZING and something that I would eat over and over again. I had spinach leftover from this Easy Weeknight Bowtie Pasta, salsa leftover from this Slow Cooker Fiesta Chicken, tortillas leftover from these Chicken Enchiladas and a little sausage leftover from biscuits and gravy. I hate wasting food, so I try to find up ways to use up every last thing. 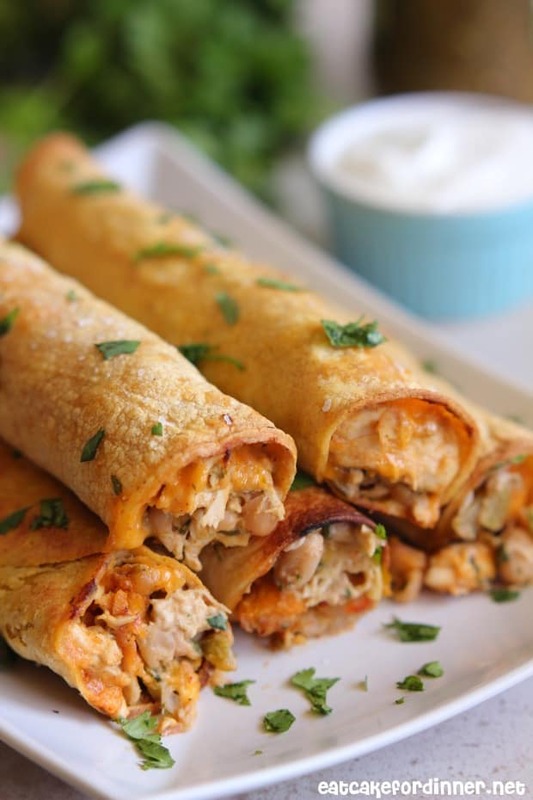 Stuffing everything inside a tortilla is the perfect way to use up all those ingredients. 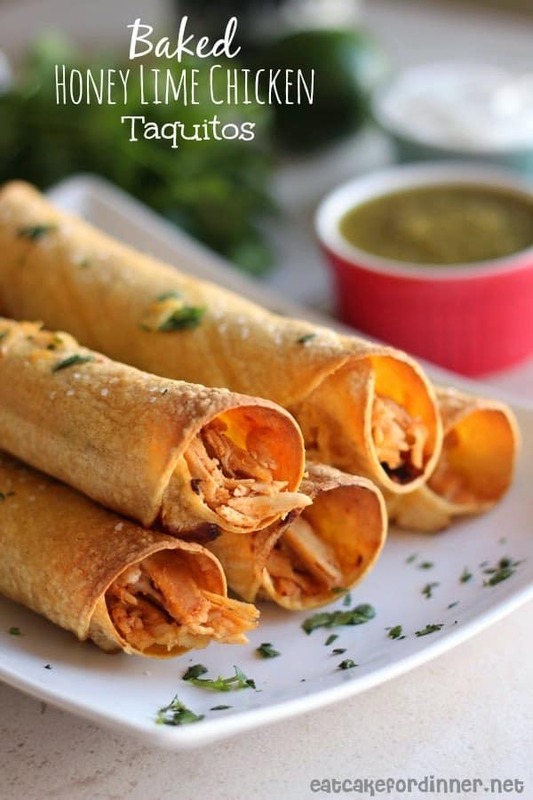 Baked taquitos are my FAVORITE. There is no reason to fry a taquito ever again, okay!! They get plenty crispy by baking them and they are so much healthier that way. These breakfast taquitos were fantastic. 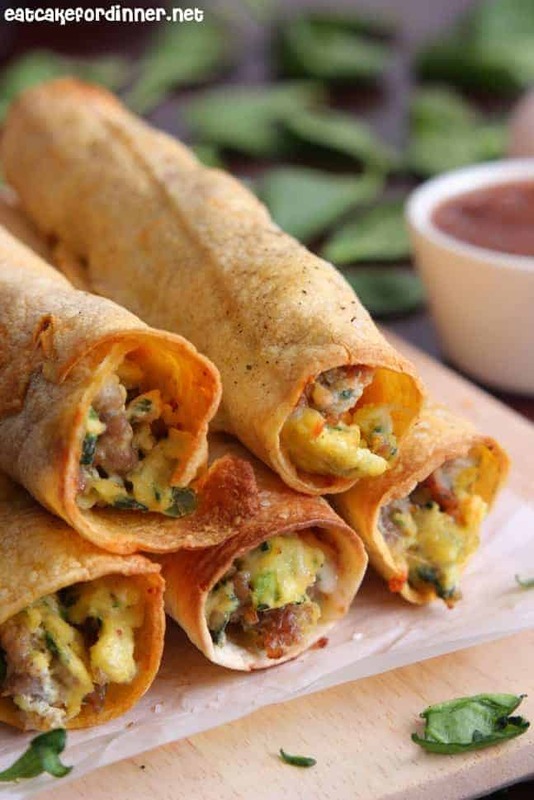 A baked taquito that is crispy on the outside and loaded with flavorful breakfast ingredients on the inside. Preheat oven to 425 degrees. Brown sausage in a large skillet over medium heat. When sausage is almost cooked through, add the chopped spinach and bell pepper and saute for a few minutes. Crack eggs into a bowl, whisk and add to skillet. Stir occasionally until eggs are just barely cooked through. Remove from heat and stir in the Feta cheese. Microwave tortillas for 30 seconds or until pliable. Divide filling between tortillas. Top each with a little shredded cheese and salsa. Roll up tightly and place, seam-side down, on a baking sheet that has been lined with foil (this makes for a much easier clean up). Spray tops of taquitos lightly with cooking spray and sprinkle with a little kosher salt. Bake for 10-15 minutes or until crispy. Serve with extra salsa for dipping. Makes 7 taquitos. 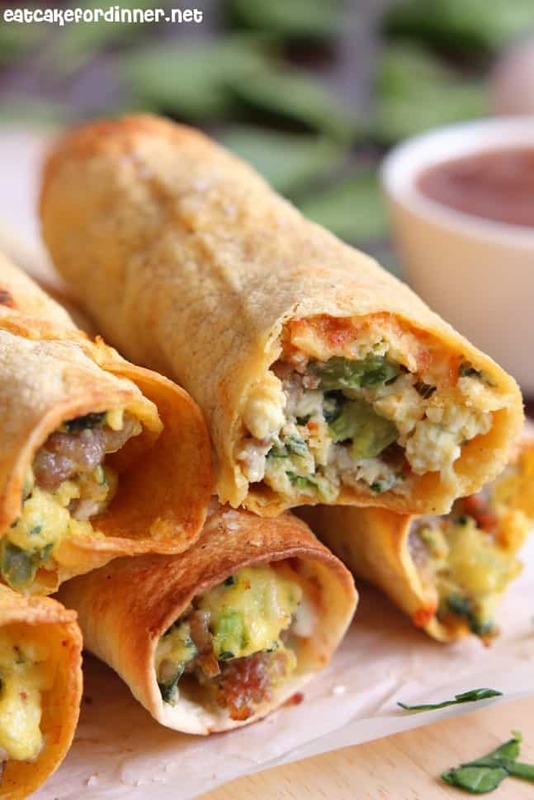 Would these breakfast taquitos freeze well and if so, how would you suggest heating them up? To freeze: As you roll your Taquitos, place them on a parchment lined cookie sheet without touching. Then place cookie sheet in freezer. When Taquitos are frozen remove them from the cookie sheet and add them all to a freezer safe gallon sized bag. When you are ready to eat just take taquitos out, place on a foil or parchment lined cookie sheet. Spray lightly with olive oil and sprinkle with a little salt. Bake in 425 degree oven for 15-20 minutes or until crispy. Can you freeze some after they were already baked ? They were so good, I would hate for the rest to go to waste! I now know what I want for breakfast tomorrow! These look amazing! Love it when I see a recipe and actually have all the ingredients in the fridge! I think that that would work just fine! Just finished making these – delicious! I served with cast iron skillet golden potatoes that I put in the oven whole browning the meat and preparing the taquitos. The man approves, yes!! 😉 — I however substituted feta for crumbled goat cheese and then took slices of Swiss cheese cut into 4 rectangles and put 2 of those on top of the insides in a line to help it stay together more when rolled and baked.15 minutes later and perfectly golden brown. Thank u so ! These are really good! I’ve made these three times now and we prefer to use cheddar or Pepper Jack in place of feta and cut down on the eggs a bit. Also, I think it’s easier to use the flour tortillas as opposed to the corn. The corn tortillas tend to crack and break. Thanks, Alyssa! I also thought about using flour instead of corn but did the flour tortillas dry out and get tough in the oven? This was so great! We made this breakfast this morning and the Husband can’t wait to have it again! Plus, we still have all the ingredients left over to make it too :)!! Yours looked so good, but mine didn’t work out well. My tortillas fell apart despite warming them, and I had a lot of extra filling–maybe my tortillas were smaller? They were tasty but definitely not pretty, and too much work for the result. This looks amazing and I can’t wait to try it tomorrow. 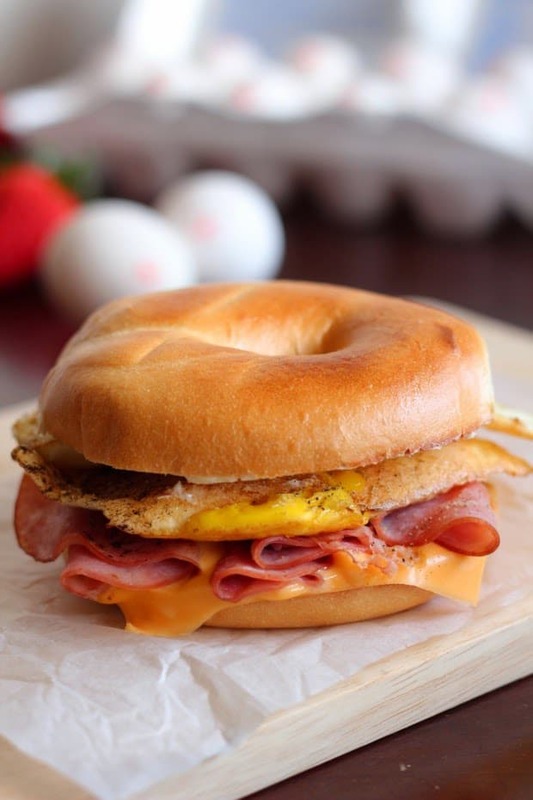 Love new breakfast ideas! This may be a super silly question but do you have a preference on cooking spray? There are sooooooo many to choose from so just curious if you have a favorite. 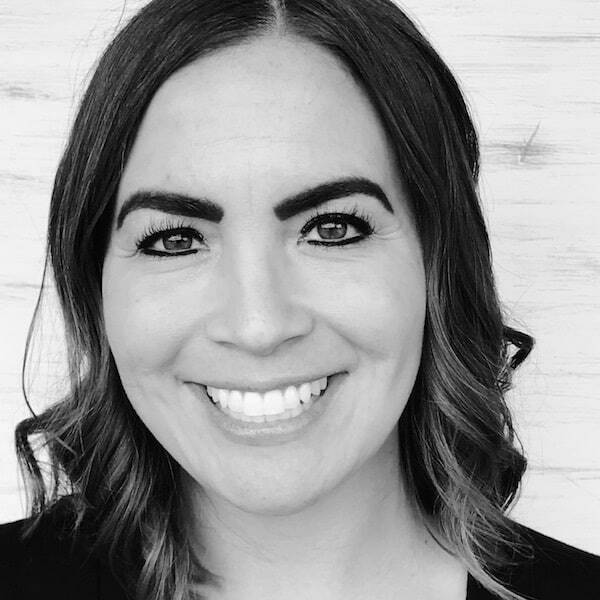 Alyssa, thank you for letting men print these recipes I had problem before couldn’t print any of them I was so frustrated. But thanks again I am a happy camper with the breakfast recipes.